Yesterday my post was VIADUCT AND TRAINS, CORNWALL and I'd like to continue this theme today. Above is another photo of the Trenance Viaduct, but from a different angle to yesterday's picture. My Internet friend, Laurent Truillet, noticed the pillars in front of the viaduct and asked if the 'previous bridge was a wooden bridge'. The original Cornish viaducts / bridges were indeed wooden - built on masonary piers. I found the photo below (in the public domain) of the Truro Railway Carvedras Viaduct from 1859. This shows the wooden construction supporting the railway lines. At the time this was done to save money, but was a false economy as stronger stone viaducts had to be built in 1899. The original stone piers remain next to the newer viaducts. 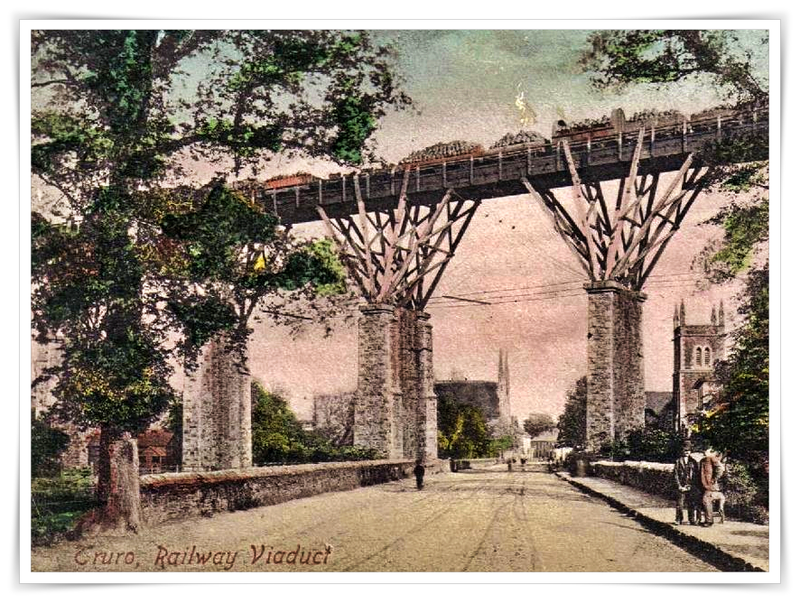 The photo below shows the Truro Viaduct from Victoria Gardens - a photo a snapped early last year. Those wooden supports look quite fragile compared to today's bridge structures. Very interesting design. The viaducts are really impressive looking with a very pleasant place to sit and watch the one in Truro! Great posts, Mike. Thanks Ann. It is said that the Victorian railway engineer Isambard Kingdom Brunel was responsible for the wooden design - he certainly got that wrong! They look very precarious. The park in Truro is very pleasant and has a bandstand for the summer nights.